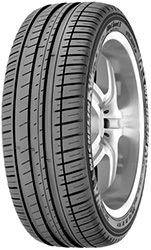 The Pilot sport 3 is the latest in the Michelen Pilot range and provides some of the shortest braking distances of Michelin's tyres. Designed for use on Sporty vehicles and high powered saloons the tyre has been used in over 15 wins at the Le mans 24 hour race. This special edition has been designed and manufacturered in association with Audi in order to ensure the highest standards have been maintained. The tyre will therefore bare the Audi AO marking on the sidewall to indicate this. The focus in the Pilot range is on driving pleasure whilst also ensuring a longevity that many other manufacturers must envy. Handling in all conditions is superb on the Michelin Pilot range, with the Pilot sport 3 learning from it's predeccesors. N.B the tyre will fit on to many other vehicles and some prefer to use the Audi approved models as a reassurance of the quality.